With as busy as things are around here, it’s not often I have time to make things just for fun! Don’t get me wrong – I really really love everything I do! But sometimes it’s so fun and relaxing to stitch or sew up a project for no reason at all – other than for fun! 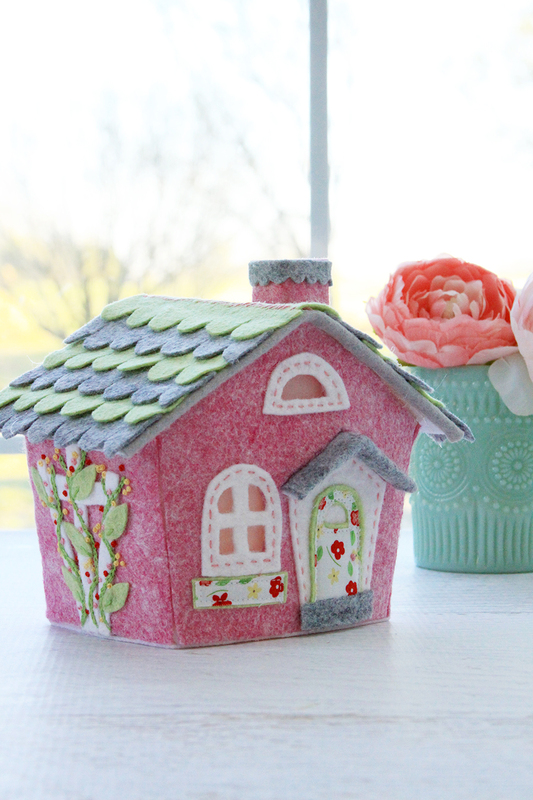 That’s just the case with this Lil’ Felt Village Stitch Along that Betz White is doing this year! 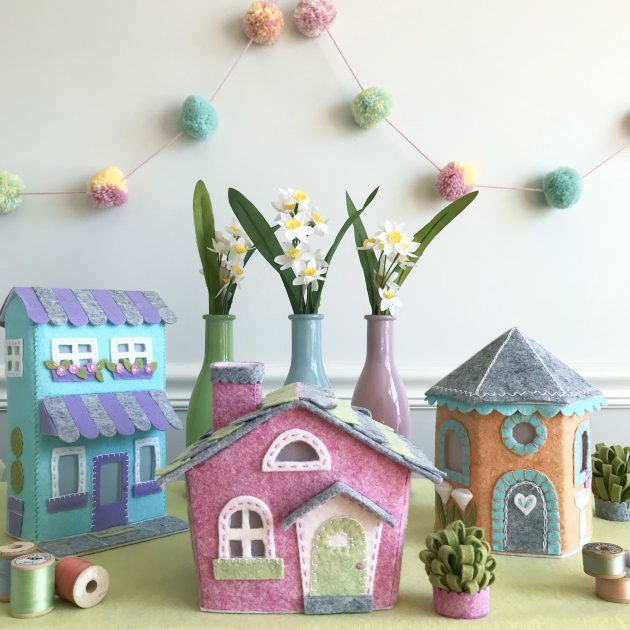 She’s doing a whole year of little felt houses (there are 12 exclusive patterns designed just for the club) and she started off with Spring. Aren’t these darling? Aren’t they sweet? 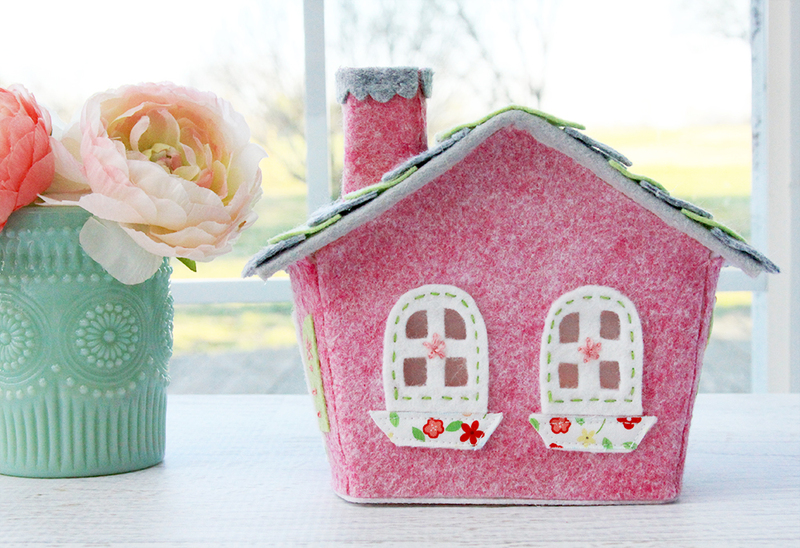 I’ve been stitching along this month with the first house, the little pink Spring Cottage. Here’s mine! I kept really close to Betz’s design – it was so cute just as it was! I just added a little fabric details and some extra flowers on trellis. The fabric is my tiny floral from Vintage Adventure – the little leaves and flowers went perfectly with the cottage colors I thought. 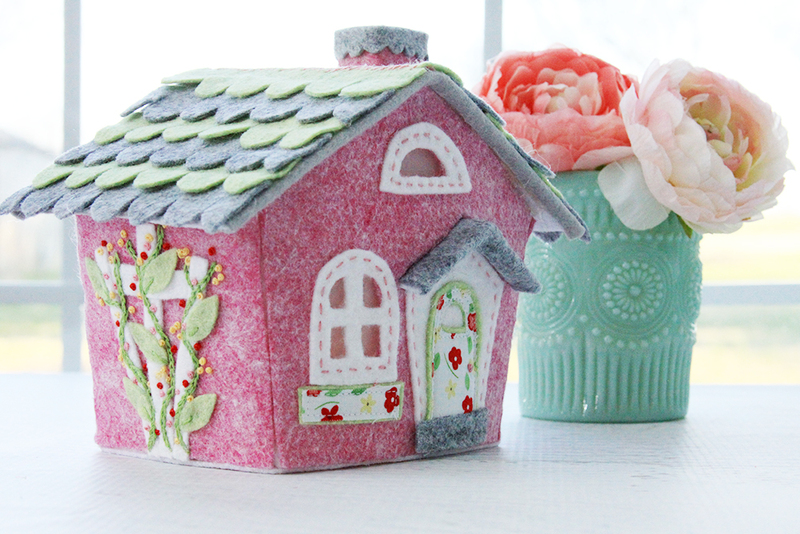 The cottage has little vellum windows and you can add a mini candle inside so the lights flicker! You can’t see it in the photos but it’s so sweet. I can’t wait to have the whole village done and have them all shining on my mantel! It’s so perfect for Spring! 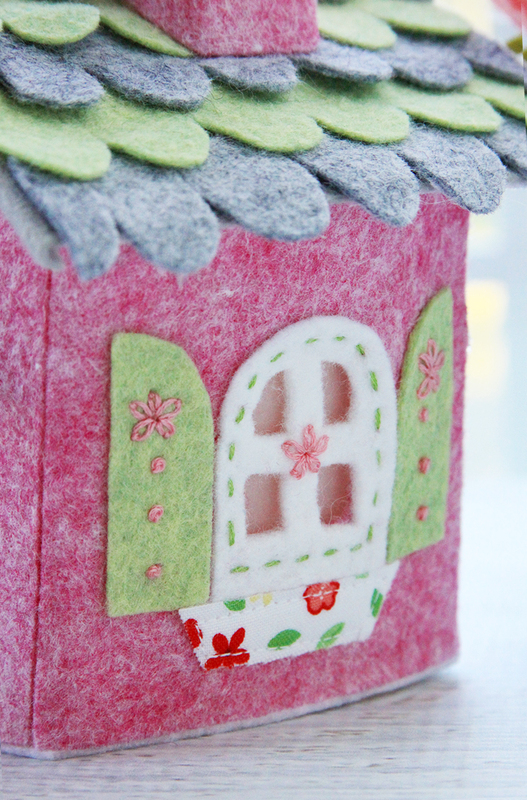 You can find out all the info for the Lil Felt Village Stitch Along here. It would be so fun if you stitched along with us! The class has been so great – Betz has done a fabulous job with really clear instructions, lots of photos, and video tutorials for all the stitches. So if you’re a beginner you could definitely join in. She also has a Spring Supply pack so you can get all the felt and other supplies in one easy place, along with a favorite tools pack! She really does make it so easy to stitch along! Check out all the details on the class here! And let me know if you’re going to stitch along!! It will so fun to do it together! 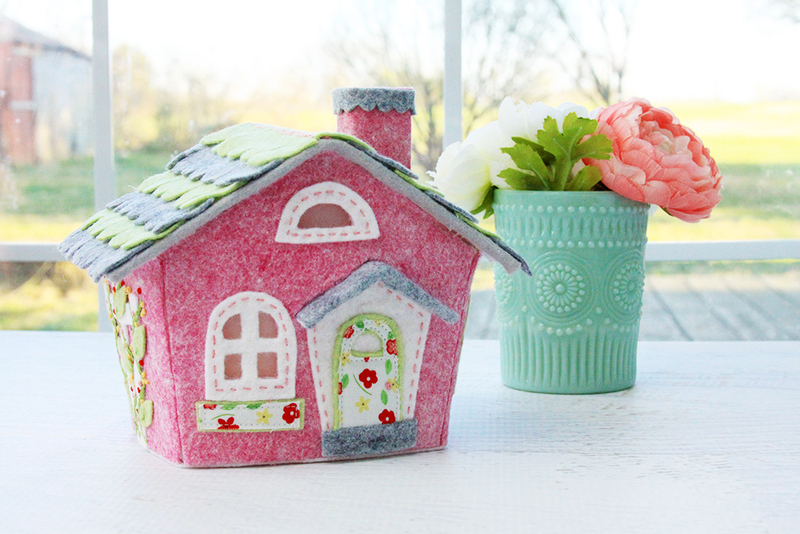 Oh what a fun idea – a bunny family to live in the Pink House. Mouse family can live next door, etc. So very cute but I am currently debulking stuff. I adored the site and the embroidery. thanks for all you do! 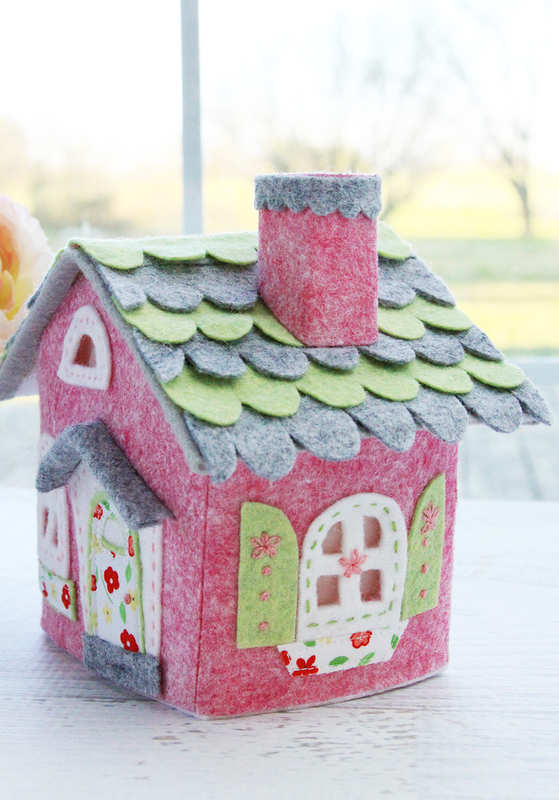 Your little felt house is adorable!! Cutest thing I’ve seen all day! I always love your work. These are so cute! I bet little girls love playing with them! This is a really neat and creative idea. I think this came out lovely ave would love to see how the rest comes out. Thanks for sharing with us at#omhgww. Hello, I’m visiting from Inspire Me Monday. This is so adorable and cleverly done. Thanks for the inspiration!